VYANKATESH PARIWAR, one of the social activity associations,NGO, engaged in creating awareness of eye donation among the common people of nation. An NGO- a resource centre for all eye banks and organisations involved in the eye donation movement. The main objectives of the Vyankatesh Pariwar are to increase collection of eyes from all over the country and to educate and motivate the public about eye donation and prevention of corneal blindness. Social work on eye donation and to generate mass awareness in public regarding eye donation and its importance. We are into the field of giving awareness to the people for ‘donating eyes’ after their death. A big role of Netradan Pracharak. Meeting with Hon. President of India Smt. Pratibhatai Patil and Members of Vyankatesh Pariwar, Aurangabad on 2nd Nov., 2008 at Aurangabad. The President of India, Hon. Mrs. Pratibhatai Patil, saw all the activities of Eye Donation work done by Vyankatesh Pariwar. She appreciated the work of Mr.Adv. Kishor Soni by saying, ” You are doing a marvellous work .” She gave a written message for the appeal of Eye Donation to every citizen, that they should donate their eyes after their death. She was glad to see the work done by Kishor Soni and his team. She also told that she knows the work done by Mr. Kishor Soni & gave us a word that she will always support this noble movement. 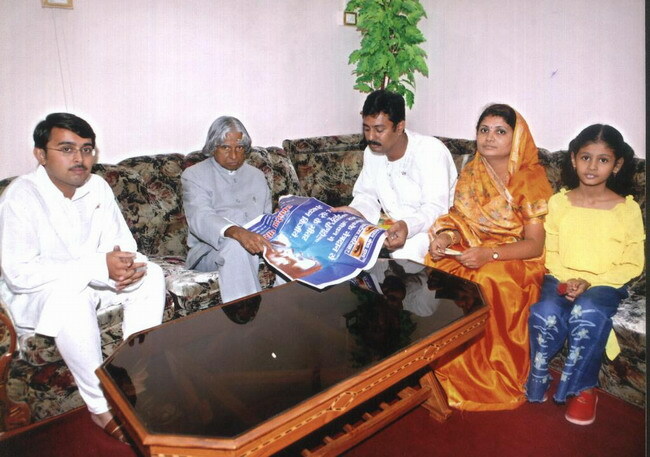 23Sept.-2004:Aurangabad:Hon president Dr.APJ Abdul Kalam sir taking information of eye donation work done by Ad.kishor soni during his visit at Aurangabad. He appreciated by “you are doing wonderful job my boy” in his 25 minutes meeting with members of vyankatesh pariwar. More than 65 Lakhs Pamphlets Distributed. More than 683 Projects Done. More then 7120 days spent on Eye Donation Campaign. 5000 Eye Donation Stickers Affixed. Daily minimum 8 hrs. devoted. Eco – Friendly Mission.. Paperless Online Campaign.